The most fascinating thing about the conversations surrounding the Obama campaign is how his near proximity to the center of the political spectrum seems to attract the ire of both the extreme left and the extreme right side of politics. The far-right conservatives accuse Obama of being the most extreme liberal presidential candidate the US has ever had, and frequently bring up his vote on on the partial-birth abortion ban (he voted present); the far-left liberals accuse Obama of pandering to the Christian right, particularly on the issue of Obama's consideration of voting for Justice Roberts, which would have added a conservative judge in favor of pro-life groups. Obama finds himself is a rather interesting place, and I find it hilarious that the two extreme edges of politics are using the same issues to argue that Obama is the polar opposite of themselves. I've argued from the beginning that Obama's position is actually just barely left-of-center, which is where I pull my own political ideology. On some issues, Obama actually falls on the right side of politics, particularly on the issue of fiscal responsibility and, strangely enough, taxes. The DailyKOS just posted a report about Obama's and McCain's tax proposal, and as it turns out, nearly 90% of the US population will actually pay less taxes under Obama's plan than they would under McCain's. 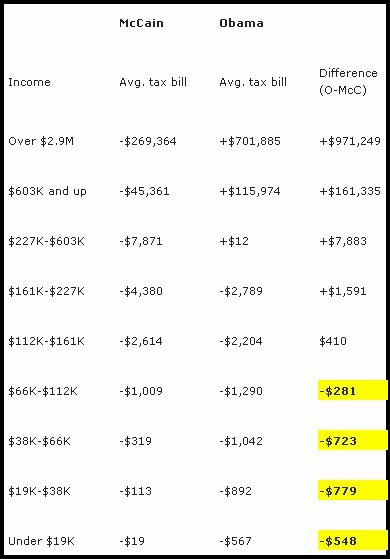 As you can see, if you're making less than $112,000 a year (and that's 89% of us, according to the IRS), you'll actually pay less taxes if Obama is president than if McCain is president. That's rather odd, considering Obama is supposed to be super liberal on every possible issue, according to the far-right conservatives. Of course, I'm sure that the far-left liberals will complain that Obama is not raising taxes even more. Wow, that is interesting! Thanks for posting this. Those of us on the far left don't believe in taxes. We're anarchists man! We're also so far to the left or right that we're in the center. On the opposite side of the circle. Government is an hallucination in the minds of the governors! Ken - I still need to read up on the dischordians. Of course, I think it's an impossible ideal; anarchy only works if people are fundamentally good. And you know I don't believe that. I've been saying forever he's a closet republican on economics. He's an anti-keynesian, corporate deregulation, torte reform, non-universal healthcare nightmare. I think he's economically conservative, not "republican." I think there's a significant difference. Do you think it's ok to deregulate -some- corporate rules, and to regulate others? I work for the insurance industry, and I think we're over-regulated, to the injury of the consumer. But on the other hand, I favor net-neutrality, which prevents internet service providers from throttling bandwidth on websites that don't pay a special fee to be on the ISP's "good" list. Saying that Obama is economically conservative is riduculous. Am I the only one that looked at the whole chart? An economically conservative politition would look to cut taxes on all income levels such as McCain's plan. Realize that the people that make those higher incomes typically are people who own businesses which employ others such as you and me. Tax the weathly to much and you give them no incentive to own and then the jobs they provide us with are gone. Dude, sorry about the typo's. I wish I could edit my post. Billy - McCain's plan further perpetuates what has often been call the rich-man's-welfare. Tax breaks for the rich make no sense, especially when you consider that those tax breaks are applied most heavily on capital gains taxes (currently capped at 15%), which apply to investments. Money that's brought in through capital gains doesn't trickle down; it's stays locked up at the top. Giving greater tax breaks to people actually spending money (below $112k) amounts to nearly 90% of the population having greater buying power. Creating an incentive to buy is what actually stimulates the economy. Rich people getting richer doesn't do anyone any good except for the rich. Locked up at the top? 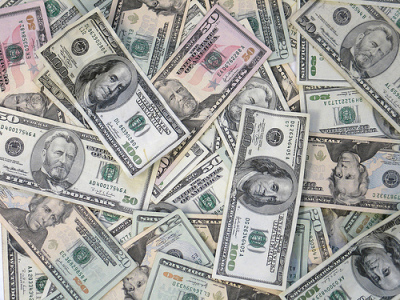 When people have more money they buy more things, I'm not saying that everyone does, but when you have more money you can buy more property, build another house, donate more, buy other businesses or put aside for retirement - a wonderful luxury we have as Americans. My main point was that a conservative view on taxes is to lower taxes for all people, so in my opinion while Obama may be more economically conservative than other democrats, that doesn�t make him economically conservative. Come on, Obama is far from the center. Of course, those who support him - as you do - would like to promulgate the notion that he's center, but his record (however small) indicates otherwise. If Obama was "near the center", a Congressional Quarterly review wouldn't have found that Obama has a near-perfect partisan voting record, casting his lot with the Democratic Party line 97 percent of the time - higher than Clinton and dead even with Sen. John Kerry (Mass.). If Obama was "near the center", the liberal lobbying group Americans for Democratic Action wouldn't have given Obama a 100 percent voting rating - 5 points to the left of Sen. Ted Kennedy. If Obama was "near the center", he wouldn't have a 95 percent liberal rating from Americans for Democratic Reform. On the flip side, if Obama was "near the center", he wouldn't have a lifetime rating of 7.67 from the American Conservative Union. Obama is a partisan, liberal Democrat. And that's okay. I'm a partisan, conservative Republican who much prefers to elect partisan, conservative Republicans. The difference is that I don't purport to be something I'm not, claiming to transcend party lines and a particular ideology. As much as you hate labels, Obama's record speaks for itself. Larry Sabato, director of the University of Virginia�s Center for Politics put it well: "[Obama's] record is liberal, and his rhetoric is moderate." Billy - as I already stated, I believe that the economy is better served by creating buying power at the lower-income levels. And I think that stimulating the economy is a conservative ideal. TCM - I've already covered Obama's voting record over at your place, and explained how the votes themselves force people into partisan position, such that anyone who is barely left of center is placed in the same bucket as anyone who is extreme left; a person who is extreme left but votes positive for a single conservative issue would come out appearing more conservative than a person who sits barely left of center and votes that way the entire time. So your conclusion from the numbers is invalid. As I stated in my post, each side views Obama as the polar opposite of themselves. The right-wing folks accuse Obama of being far left; left-wing folks accuse Obama of being a "closet Republican." Not to take sides but to be fair I think Josh that you're the only person I've heard argue that BO is not very left. Every major news media I've listened to (most of which lean left sometimes heavily) have acknowledged the fact that the Senator is very left leaning and that it creates a problem with his attempt to reach a broad group of people including conservatives. To say he's centrist is really silly when his own party describes him as "very liberal" and "on the far side of left" making even some leftists uncomfortable. It doesn't appear at least that you're seeing this fair mindedly. Luke - note what Red Queen posted above: I've been saying forever he's a closet republican on economics. He's an anti-keynesian, corporate deregulation, torte reform, non-universal healthcare nightmare. Much of what Obama says regarding the economy does sound like something an economically conservative person would say. The Conservative Manifesto's mention of Sabato's quote regarding Obama's rhetoric indicates that Obama is engaging in political pandering... but I don't agree - I think that his position on the economy has been consistently conservative. I don't believe that Obama is centrist. I think that a centrist, by definition, aims for a non-partisan approach in everything they do, as though being centrist is the objective. I think that Obama's position on a lot of issues just happen to dance near the center because that's who he is, and not because he's aiming for the center. And I think that claims suggesting that he's hyper-left are all based on his voting record, which, as I said before, don't accurately reflect his feelings on the issue. I think that people on the left who are concerned with his "very liberal" and "on the far side of left" position are talking specifically about his voting record, and are considered about the political implications, in terms of trying to capture voters. And you really have to take it on an issue-by-issue basis; Clinton is more liberal on the issue of healthcare than Obama is, for instance.